Died: 10th August 1916; age 36; Died of Wounds. 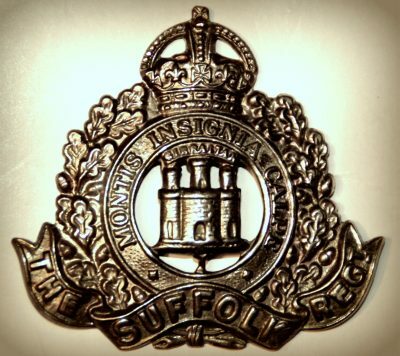 Rank: Private; Service Number: 23474; Regiment: Suffolk Regiment, 7th Battalion. Relatives Notified & Address: Husband of G.M. Bardwell, of 49, Hartley Street, Ipswich. 1881 98, Woodhouse Street, Ipswich. William was a year old and living with his mother & sister. Louisa Bardwell (nee Nickels), 33, born Wickham Market, Suffolk. Ellen Maria Bardwell, 4, born Romford, Essex. In 1881, William’s father Frederick Bardwell, 31, was a Charge Attendant at the Ipswich Borough Asylum, Foxhall Road, Ipswich. 1891 The Leyden and Winstree Workhouse, Stanway, Essex. William was 10 years old and with his family were inmates at the Workhouse. Charles Bardwell, 9, born Ipswich. Florence Blanch Bardwell, 7, born Ipswich. 1901 10, Albion Grove, Colchester, Essex. William was 21 years old, an Iron Foundry Labourer. He was married and living with his wife, widowed father & brother. Frederick, 51, a General Labourer – Road Labourer – Corporation. 1911 53, Roseberry Road, Ipswich. William was 31 years old, a Painter – Foundry. He was married and Head of the Household. brother – Edward, 23, a Labourer – Foundry. Gertrude Violet Bardwell, born 1904, Colchester. William Leonard Bardwell, born 1908, Ipswich. Lilian Ivy Bardwell, born 1910, Ipswich. Doris L. Bardwell, born 1912, Ipswich. William’s mother Louisa Bardwell died, 1900, Colchester, Essex.